THE NEW CHILLER PLANT for the University of Virginia will house chilled water capacity for the campus buildings near Newcomb Road in the Central Grounds area. The initial build-out will include equipment installed for 3,000 tons of chilled water capacity. Long-term plans include the possibility of extending the building to the east to accommodate a total of 6,000 tons of chilled water capacity. 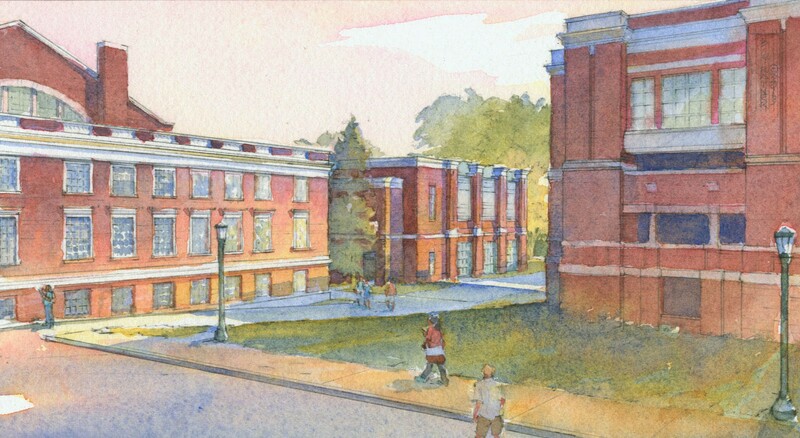 The building will be situated north of the Central Grounds Bookstore and Parking Garage, and east of historic Memorial Gymnasium. The architectural design by Glavé & Holmes Architecture (G&HA) responds to the character of the adjacent buildings and also reflects the functions of the industrial elements within. The north and south façades are organized by three structural bays, which consist of steel column piers with molded face brick cladding. Each of the three bays has a brick base and mechanical screen above to partially obscure the rooftop cooling towers. The north façade has large punched windows in the center of the bays at the first floor, while the south façade has large storefront windows to allow for the infrequent removal and replacement of chiller equipment. At the roof level of the façades, structural steel columns clad in molded brick serve to frame the louver screen system while allowing for maximum accessibility for the cooling towers beyond. The inverted louvers are meant to provide sufficient visual screening and acoustic deflection and still allow for the ventilation requirements associated with the cooling towers. G&HA worked in collaboration with Affiliated Engineers, Inc.